When it becomes time to close your swimming pool, the chemicals that you place in the water are just as important as the ones you use to open the swimming pool. When proper chemicals are not used to winterize the swimming pool by the time you open it in the springtime you are going to end up spending more money and more time to clean it. So what chemical kits are the best to use? There are many great brands out there but only a few will get the job done. The best part about the brands that work is that you can actually find them at your local swimming pool supply store. Keep in mind that some of these brands may be a bit more money than you want to spend but think of the time and money you will save in the springtime. The top three best brands of 2009 are BioGuard Artic Blue Winter Chemical Kit, Omega Pool Winter Chemical Kit and the GLB Pool and Spa products Gallon Winter Algaecide Kit. Anyone of these winterization chemical kits will help you keep your swimming pool healthy during the cold winter months. By the time comes to open your swimming pool you will see the difference when using these kits rather than the old kits you used to use. 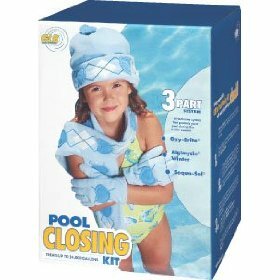 Let’s take a look and see what makes these brands the best winter pool closing chemical kits of 2009. BioGuard is one of the most recognized names in the swimming pool chemical industry. 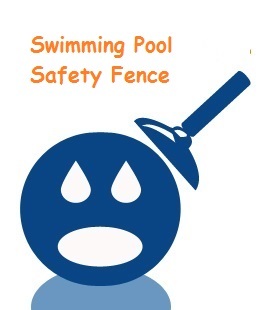 This product is safe for use on both above ground swimming pools and in-ground swimming pools. 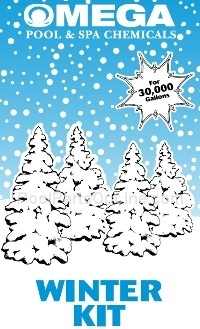 Artic Blue Winter Chemical Kit is available in two different sizes. One of chemical kit can treat water up to 12,000 gallons and the other can treat up to 24,000 gallons of water. This is not just a one product chemical kit, inside this kit you will find the Artic Blue Algae Protector, the Artic Blue Shock, Winterization Chemical Instructions and even some money saving coupons. This complete winterization kit offers everything you need and more to set your swimming pool up for the winter. This product will help keep your swimming pool clear and algae free during the cold winter months. 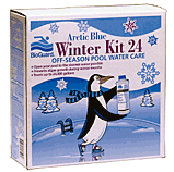 BioGuard Artic Blue Winter Chemical Kit is affordably priced at $ 25.86. You can find this product in your local swimming pool supply store and on many online swimming pool chemical sites. The Omega Pool Winter Chemical Kit is a complete kit that comes with everything you need to keep your swimming pool healthy and clear this winter season. When you purchase the Omega Pool Winter Chemical Kit you will receive the Winter Clear Oxidizing Treatment, this is used to help prevent the build up of dead chlorine. The Winter Clear Stain Guard is there to help eliminate any mineral or scale build up that may form under the cold water temperatures. Also included is the Winter Algaecide 30 that is used to help stop algae growth while the pool is closed. 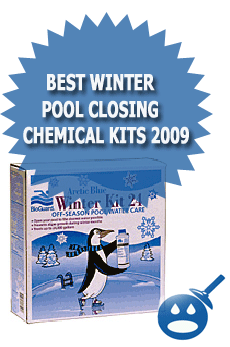 The Omega Pool Winter Chemical Kit should be balanced before you close the swimming pool. You should test your water for proper Chlorine, pH, Alkalinity, Calcium Hardness and Total Dissolved Solids. Some recommend that you keep your swimming pool open as long as the weather allows and open it the same way. This system also comes in two sizes, the 15,000 Gallon Kit comes with a pint of Algaecide, a pound of Stain Guard and 20OZ of Non Chlorine Shock. The second kit is for swimming pools up to 30,000 Gallons, this kit includes a quart of Algaecide, 2 pounds of Stain Guard, 2.2 pounds of Non Chlorine Shock. The price of these kits is $23.60 and $33.19. You can find them online or in your local swimming pool supply store. GLB is one of the best brands in the swimming pool industry. With this swimming pool kit you will receive a three-part system that will control and get rid of any contaminants with a chemical called Oxy-Brite. This will stop the growth of algae and offer protection from mineral and scale build-ups. Also included in this package is Sequa Sol this chemical agent will hold iron, manganese and copper so they do not mix with the other chemicals. You will get everything you need and more with this package. The GLB Pool & Spa Product Gallon Winter Algaecide Kit works on both above ground and in-ground swimming pools up to 12,000 gallons. This chemical kit is compatible with Ozone and Chlorine and Bromine Sanitizers. This product is great for salt water pools too. GLB is reasonably priced at $24.50. This three part systems can be found in your local swimming pool supply store or online. Just because you are closing your swimming pool doesn’t mean that you shouldn’t put less care into taking care of it. With the right chemicals your swimming pool should be ready for the spring without spending a lot of extra money and time clearing up the effects of winter. You can find these great products at any swimming pool supply store or local home improvement store. If you have any problems finding them, you can check online. There are many great websites that offer winterization kits including the three we profiled. These products are safe for your swimming pool and they won’t cost you a lot of money. Do some comparative shopping and see which chemical kit will work perfectly in your swimming pool. To save yourself time and money, check out these winterization kits and make a plan to keep your swimming pool water clean and healthy all year round.